Are you ready for Declutter Success? - Chalking Up Success! 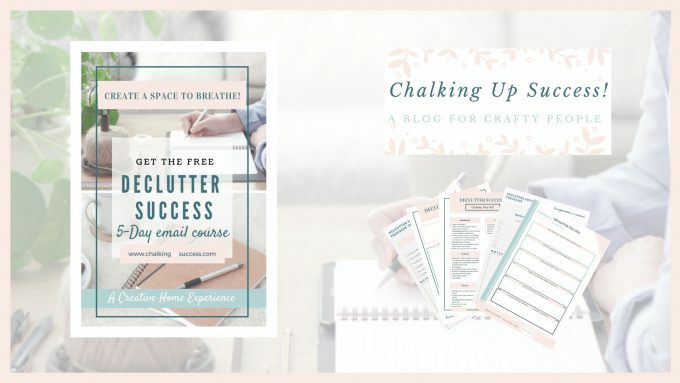 Come and join us in Declutter Success a creative home experience from Chalking Up Success! It’s already been put to the test by yours truly so I know it works. 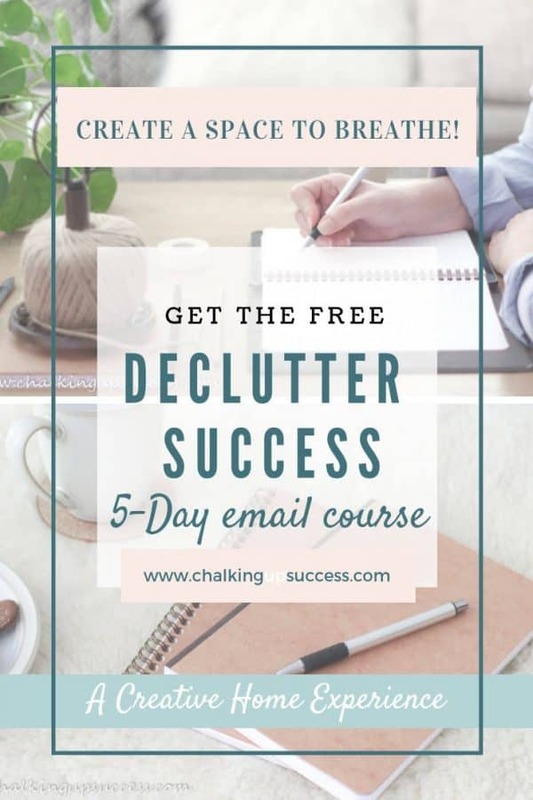 Declutter Success is a 5-Day email course and is currently FREE with our Newsletter. Share your progress with us on Instagram so we can cheer each other on and help each other out. You’ll find our hashtags in the post below. Do you wish your home was like the gorgeous homes you see on social media as you scroll through your feed? Well, what you see in the pictures may not be what it appears to be. You see a beautifully styled corner or room but you do not see what is out of shot, you do not see the whole picture, you see a filtered version of reality, an illusion. That is not what we are about here. We are about creating YOUR haven however that may look for YOU! Do you think achieving peace at home is even possible for you? Well, you know, it is possible. It’s possible for you and it’s possible for us all. Small steps are all we need to take at first because small steps pave the way to greater steps then strides and then to leaps and bounds. You WILL have your dream of a peaceful haven. You WILL walk in the door and give a sigh of relief at the calm that embraces you even before you take off your shoes. When your home is so full of clutter that there’s no space to breathe, stress is created in your heart and in your mind. The world is a busy place, full of stressful situations, noise and clutter. Home should be a refuge from the storm raging outside the door. 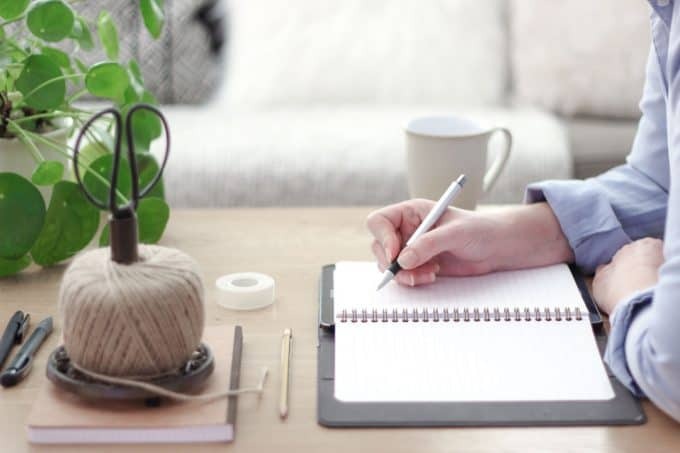 As for me, I’m determined to make small sustainable changes that will transform my home and business over the coming months. The first change is going to take place in our bedroom. We finally found a company to build our walk-in wardrobe – yay! We’ve been told that work can start at the end of January and I just can’t wait for that space to be organised. Right now, we have a few old Ikea wardrobes in there but most of the drawers will only open by force because the sides of the wardrobes have moved out of sync (too many house moves!). We also don’t have enough hanging space – well, I don’t have enough hanging space haha! Anyway, before the walk-in is fitted, I have to declutter big time! I am also determined to keep the space more organised by corralling small and like items like socks (why can I only ever find one of a pair?) into their own containers. Little by little the wardrobes are being decluttered and boxes are being ticked. I found a jumper I thought I’d lost and a pair of jeans belonging to one of the boys – oops! I’m determined, everything will have its own hanger in the new space so I don’t have to look under five layers of shirts to find the one I want! As always, I’ve made a plan of action and am gradually ticking off boxes. I work better and get more accomplished if I have a clear vision of how I want the space to look at the end. This also helps me so much in my decluttering process, which I know for some, can be overwhelming at times. With this in mind, I’ve decided I’m going to go about my decluttering ‘Lagom style’ – not too much, not too little, just enough! If you’re wondering “What the heck’s Lagom?”, you can read all about that in the post Lagom – A balanced home is a happy home. I usually find the hardest part of decluttering is actually getting started. To help me stay on track, I made some lovely printable worksheets – I’m a box ticker haha! They are helping me so much that I thought my newsletter subscribers may like to have them too. So I bundled them all up in this 5-day email course just for you! If you’re not a subscriber but you’d like to join us, you can sign up for the 5-day email course by clicking the image below. 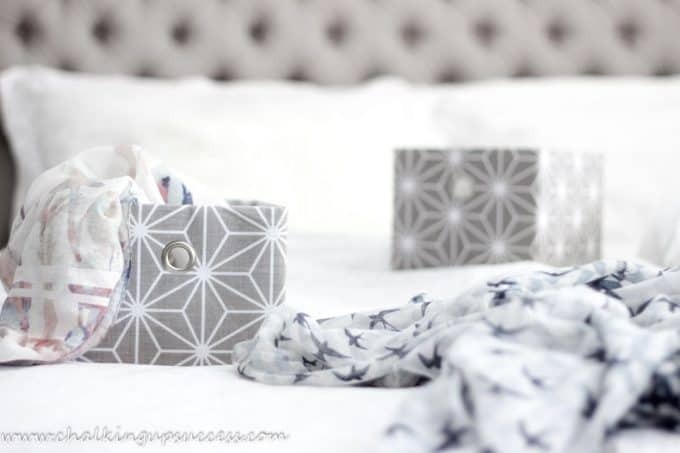 Don’t worry, declutter success doesn’t have to be stressful if you do it Lagom Style. So now it’s your turn. You can create the home you’ve always wanted, you just need to make a start. Make your start now by signing up for Declutter Success! Share your progress, with us on Instagram using the hashtag #chalkingupsuccess or the brand new hashtag #decluttersuccess so we can cheer each other on and help each other out. Even if you don’t want to share, let Declutter Success help you take the first step to a peaceful uncluttered home.